If I wanted to add money to my 401k account how much would I be able to contribute? The contribution limit for 2016 pre-tax is $15,500. If you are over the age of 50 you could are allowed to contribute an extra $5,000 per year. There are many plans available with some giving the offer to add money to an after-tax fund which does not include the $15,500. This will give you the option to decide if you want to allow catch-up contributions as well. Pre-tax or after-tax contributions: what is the difference? Pre-tax contributions are only taxed when you withdraw from the account. These taxes can accumulate quickly and apply directly to the plan. The after-tax contributions are only taxed on 401k withdrawals. This is one of the most frequent 401k rollover questions we get from investors. Maximizing the match that the company offers is strongly recommended. However, you should only invest an amount that is comfortable for you. Is my employer allowed to change my 401k plan rules? Yes, this action is legal. Each company has the responsibility to make sure that they are offering the most competitive performing funds to you and the other employees. My company doesn’t offer an investment fund that I like. What can I do? That is where your human resources representative comes in. They have all the information you are going to need to get started and find the 401k investments you need. Your employer has a retirement savings plan arrangement. It is the employer’s responsibility to make sure that competitively performing funds are provided. Once you leave that job you can move your plan to a more flexible custodian. If I am still working will I be able to withdraw money from the account? Some 401k plans allow for 401k loans and others do not. The ones with loans allow you to borrow money but the downside is that you will have to pay back the loan, plus interest. If the interest amount is not paid it will become an outstanding balance subject to the current income tax laws, and eligible for a withdrawal penalty. The plans that don’t offer loans can assist you by offering you a severe financial hardship withdrawal. If I can’t afford to keep paying for my 401k plan can I stop contributing to it? In many cases you can stop at any time contributing to your plan. It depends on the plan that you have through your employer. Some do require that a specific amount will still need to be contributed for a full year. Check your plan and see if there are any specific rules that require a certain percentage to be contributed. If I end up leaving or am terminated from the position I hold what will happen to my 401k account? It won’t matter whether you were terminated or left voluntarily; the distribution options will be the same regardless. If you have accumulated over $5,000 then you will be able to leave the money in the plan as is. If you decide that you want to go ahead and take your money when you leave then you can have it rolled into another 401k account or an IRA. This will help with any early 401k withdrawal penalties. At the date of my termination how long can my employer hold my account balance? There are three factors that can affect the timing of your money being distributed. The plan you have chosen has its own time frame to follow as documented in the document’s summary plan. There are even some cases when the participant isn’t able to have distributions made until they have reached retirement age. Once you turn the age of 65 you will then be able to get distributions. There are also the instances when distributions can’t be made due to the company determining balances on valuation dates. This helps determine the amount of money that each participants has. This can be done daily, monthly, or even yearly. Depending on how long you have invested your money could be a contributing factor that can affect distributions of your money. The type of investments made will affect how quickly distributions can be made. Processing paperwork is another issue that can cause distribution times to vary. What 401k information is my employer required to give me? It is required that your employer give you a copy of the summary plan description of your plan and an annual statement showing all of your account information for your records. By law, you have the legal right to ask for information at any time. Also, if your company has stock it is required to give you a copy of the prospectus on the company’s stock fund. What is the required time frame that is required for my employer to deposit the contributions I have made into my account? It is required by government regulations that all of the participant’s contributions that are contributed to a 401k plan be deposited as early as possible. The typical date for contribution deposits on the 15th business day of each month. If I still have a 401k account with my former employer can I have it transferred over to my IRA? If this is allowed, and/or are there any penalties involved? Yes, this is known as a trustee-to-trustee 401k rollover. All you have to do is request the distribution 401k rollover forms from your old employer. Once your former employer has given them to you then you can transfer your 401k to an IRA. There are no penalties for a trustee-to-trustee transfer. If the former employee sends the funds to you directly then there will be a deduction and 20% will be remitted to the IRS. What are the rules that involve hardship withdrawals in a 401k account? Your employer is not by law required to provide this option in your plan but hardship withdrawals are allowed. In your summary plan you will be able to distinguish if that was a part of your plan in the first place and if your employer allowed it. Usually the IRS code will permit hardship withdrawals only under certain conditions. 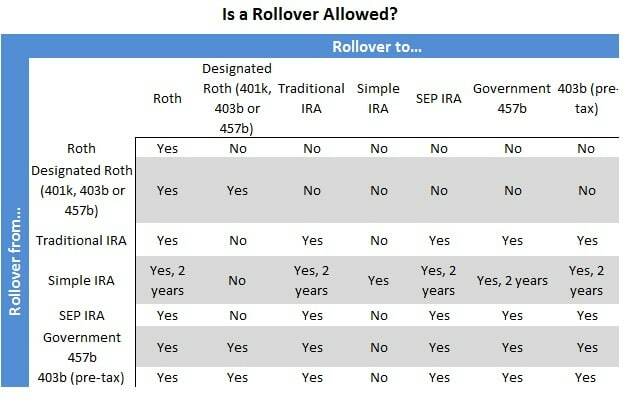 The aforementioned 401k rollover questions and answers are only a small sample of the most common 401k rollover questions. This page is changed frequently to allow for new and updated answers.